Kefalos brings you a wonderful harbour with historic buildings, and beautiful gardens stretching up into the hillsides. From here you can enjoy spectacular views over the glittering blue waters of the sea, as well as a selection of excellent restaurants, hotels, bars, and shops. Visit the remains of the town’s castle during your stay and soak in the Roman history of Kos island or simply wander through the older streets which are lined with Venetian architecture housing boutique hotels and local homes. The newer side of Kefalos offers an excellent range of restaurants and bars which have been built up around the thriving tourist trade of the town. The beach makes it an ideal choice for couples and families, with its photogenic golden sands well known to the island’s brochures. Spend the day ordering drinks and snacks to your lounger, swimming in the sea, or enjoying jet skiing trips, and exploring the coastline. Holidays in Kefalos bring you the golden sands and crystal clear waters Kos is so well known for, with yachts and fishing boats ideal for those wanting to spend a day exploring. Ancient ruins are just waiting to be explored, while the pretty hillsides are ideal for hikers and mountain bikers wanting to take in some spectacular views. Kos Town is under an hour’s drive away and is home to a further selection of bars, shops, restaurants, and amenities. Speak to one of our Trusted Advisers today and we’ll help you find the ideal hotel for your luxury holiday in Kefalos. We’ve tried and tested each of the hotels we offer to ensure you can make the most of your time away. 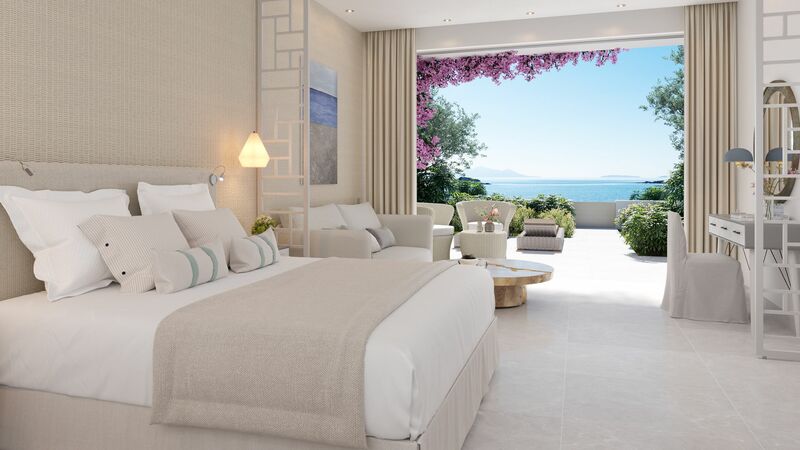 Book the IKOS Aria for an all inclusive holiday like no other. Their reimagined package, the infinite lifestyle, offers you a selection of over 500 wines, excellent cuisine, and activities for both adults and children. Transfer time from Kos airport to Kefalos is approximately 20 minutes.